With summer fun comes summer towing. 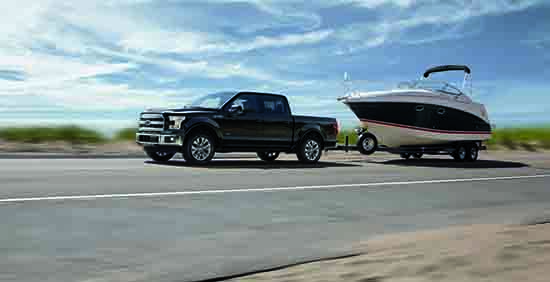 No matter the size of boat you're trailering, being able to tow it safety from point A to point B can be the difference between a weekend of fun and one that turns you into a nervous wreck. But fear not! Safe towing is a pretty simple process provided you follow a few basic rules. While not meant to be a comprehensive guide to cover every towing situation or condition, use these tips to help ensure that your towing trip doesn’t end as a tragedy. Two other factors to consider are the gross trailer weight (GTW) and the maximum tongue weight. Gross trailer weight is self-explanatory—it’s the overall weight of the trailer and its contents. Maximum tongue weight is a measurement of how much weight rests on the hitch. Ideally, the tongue weight should be approximately 10 percent of the trailer’s weight. Too little weight on the hitch and the trailer will have a tendency to sway back and forth. Too much weight on the tongue will take weight off the tow vehicle's front tires and make it harder to steer (and it will overload the rear suspension). When picking a hitch, always go large and install one that’s heavy-duty enough to match your vehicle’s GTW, even if you’re planning on towing only a smaller trailer. And don’t forget to factor in the weight of the trailer's contents—including the capacity of the freshwater, gray water and black water tanks—when you're shopping hitches. When it comes to hooking the trailer to your hitch, always use the right size ball for the trailer. Even if it’s close in size, never use a smaller ball, as the trailer could pop off during travel. Make sure the ball mount has the right amount of drop (or rise) so that the trailer is more or less level when attached to your vehicle. Always use safety chains, and cross them in an X pattern when attaching them so that the chains cradle the tongue of the trailer if it accidentally comes off the ball. Plug in the electrical harness, and verify that all the turn signals, running lights and brake lights are functioning. When out on the open road, take turns later, slower and sharper to square off the curve to prevent the trailer from clipping curbs (or other vehicles). If the trailer starts swaying from side to side, gently apply the brakes to slow down and bring everything back into line. Most importantly, give yourself more space behind other vehicles so that there's plenty of room for braking. For example, a full-size, four-door pickup going 60 mph typically stops in about 150 feet in an emergency braking situation on dry pavement. Add a 4500-pound trailer package and that distance can easily increase to 220 feet. As a general rule of thumb, leave at least four seconds when road conditions are good between your vehicle and the one ahead of you. When road conditions are bad, increase that distance to six seconds. Remember—your safety and the safety of other motorists rest in your hands. By following these tips and talking to your local marine dealer if you’re unsure about any part of the process, you’re bound to have a safe and enjoyable towing experience this summer and a fun day on the water. Need to find a new boat? Search BoatSoup.com now!